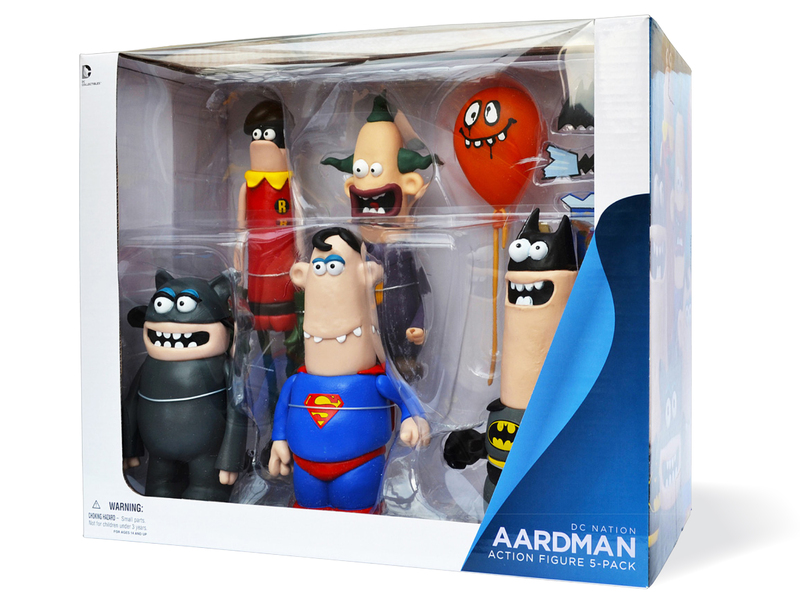 Aardman & DC’s World’s Funnest action figure 5-pack | 'TAIN'T THE MEAT… IT'S THE HUMANITY! Out of all the thousands of action figures that they have released over the decades, this five-piece set must rank as one of the strangest, and sweetest, ever released by DC Comics. 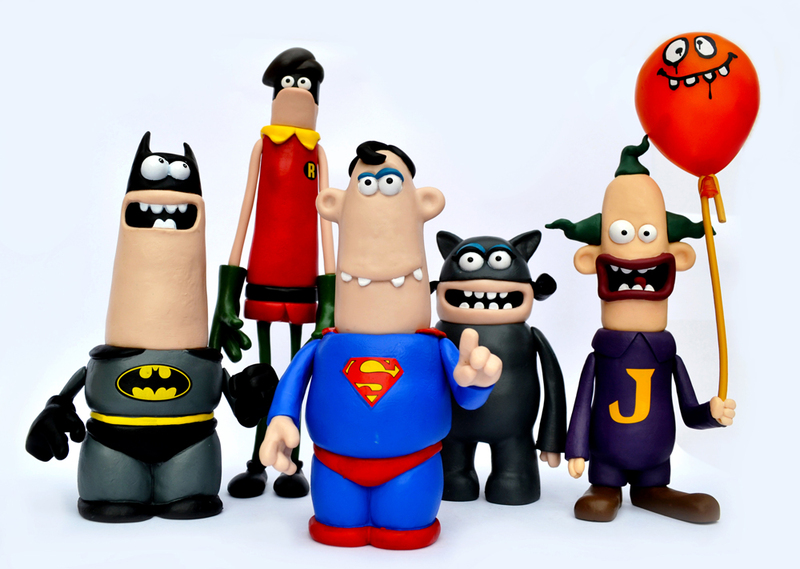 DC’s World’s Funnest is a series of nine 60-second short films produced by Academy Award winning filmmakers Aardman Animation, creators of Wallace and Gromit, and broadcast during the Saturday morning DC Nation block on Cartoon Network. 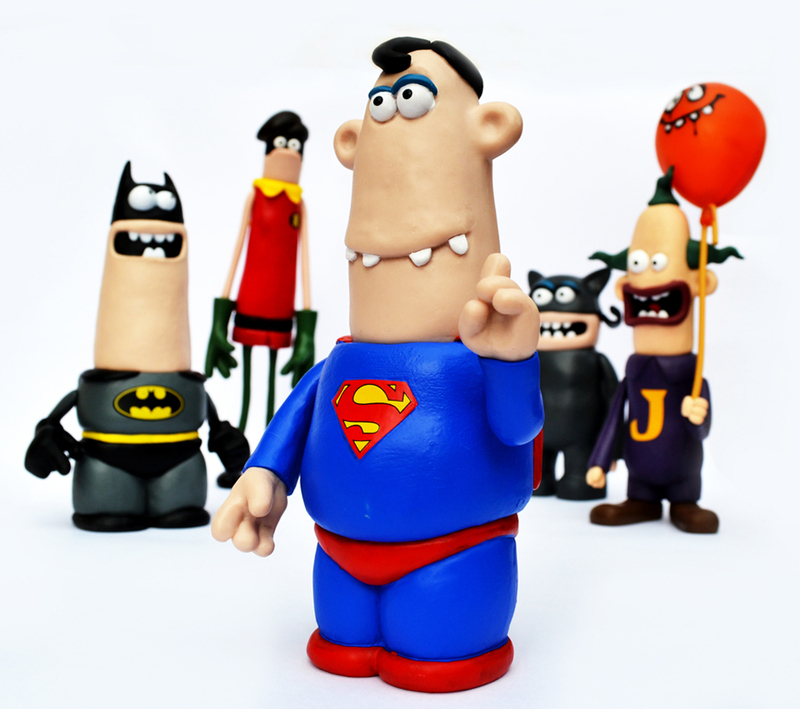 Based on the same format as Aardman’s Creature Comforts short films from the early 2000’s – animated characters voiced by ‘ordinary’ members of the British public – these short cartoons feature five of DC’s mainstays voiced by children. 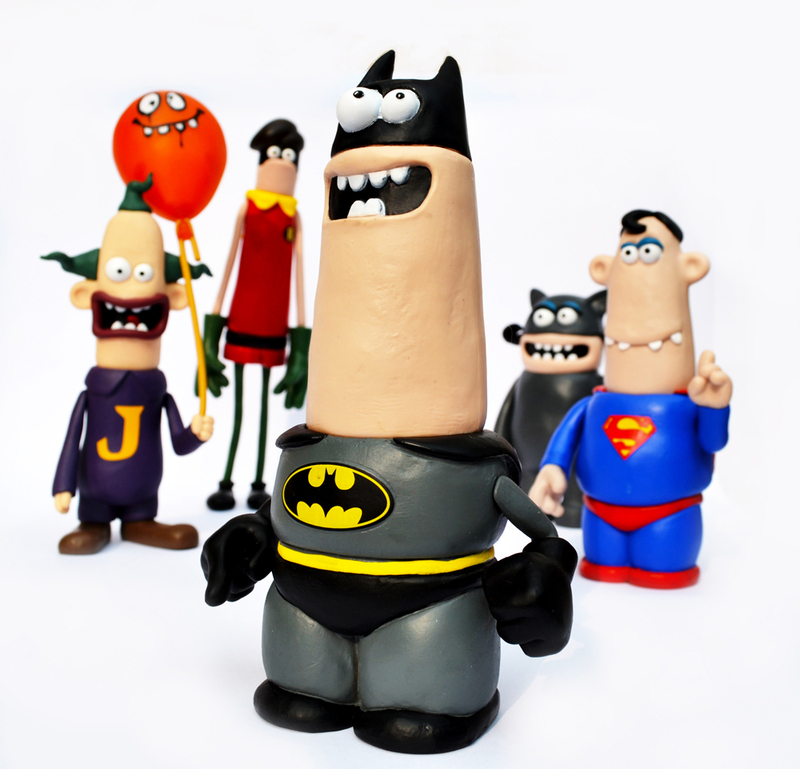 Superman, Batman, Robin (who never speaks), Catwoman and The Joker all receive the trademark Aardman stop-frame animation makeover. 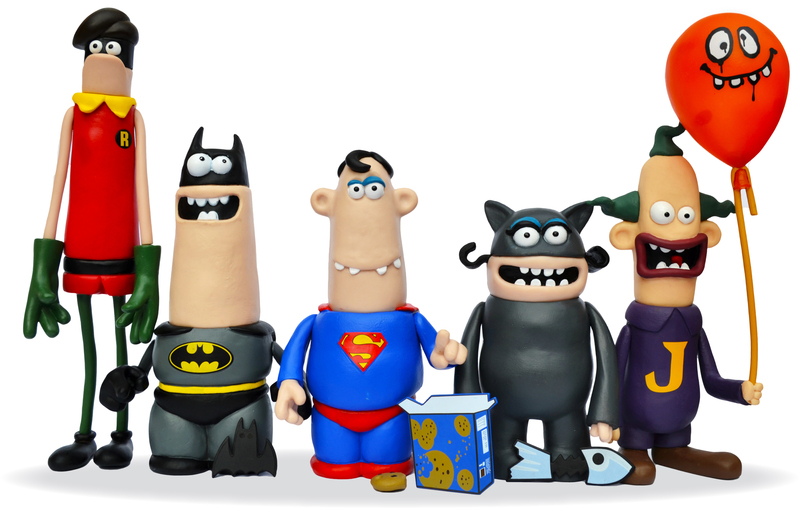 As is typical with Aardman the cartoons are beautifully animated, charming and very funny. Superman does nothing but sit on a rooftop eating cookies and accidentally firing off his heat vision whenever he sneezes. A hyper-active Batman constantly runs about challenging a lanky Robin (clearly inspired by Beaker from The Muppets) to a race, while a giggling Joker chats about his new shoes and brags about how many jumps he can do (I can’t be alone in thinking that The Joker voiced by a child makes him delightfully creepy). DC Collectables have released two vinyl sets based on the characters from DC’s World’s Funnest, one with Batman and Robin and this set featuring all five. The figures measure between five and a half and nine and a half inches in height and have a very satisfyingly chunky, solid feel to them. 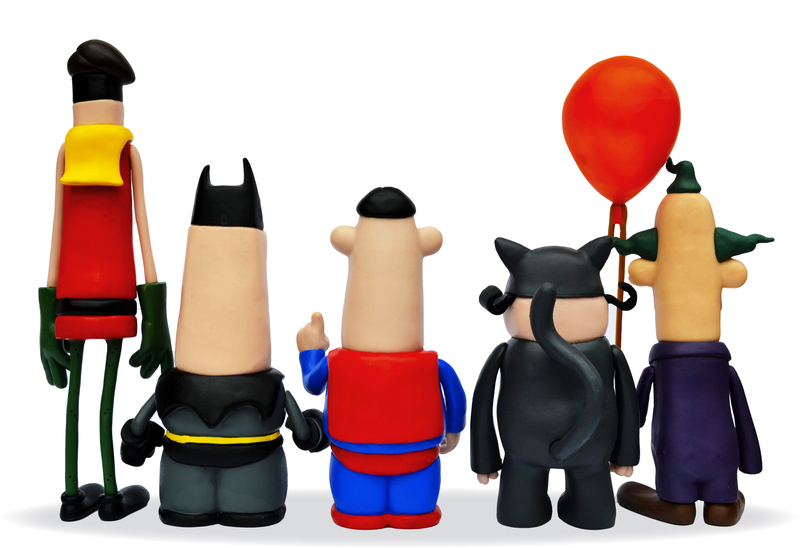 All the figures feature articulation to the arms (apart from Batman whose head swivels) and four come with accessories: Superman has a box of cookies; Batman a batarang; Catwomen a fish and The Joker comes with a large orange ballon. The modelling on the figures is almost an exact match to those used in the cartoons – so similar in fact that if they featured a little more articulation, say to the elbows and knees, you could probably use them to create your own animated films. The figures come securely shipped in a large 13in x 11in box with a thick cardboard inlay, two pieces of blister packing and a ton of twist ties – so secure is the packing that it took me and a Stanley knife about 20 minutes to liberate the little blighters (the tiny ties on Batman’s wrist and Robin’s ankles really gave me some gyp). However, as faithful as they are to the originals, there are a few problems with a couple of the figures: Robin’s legs are not the same length so he has a habit of toppling over, and the hole in The Joker’s left hand for his balloon to slot into isn’t quite big enough, making if difficult to keep the balloon upright. Granted these may be small niggles but they’re a little vexing for the £/$75 price tag. The last DC’s World’s Funnest short was broadcast on US TV in December 2103 and there’s no word yet if the series is set to continue (or if any of them will be shown in the UK). In the meantime fans will have to make do with this charming five-piece set and watching the shorts on YouTube.